Cosplay is great. It can be well done, it can be poorly done, it doesn't matter, so long as it brings joy to both the cosplayer and the viewer. Just take a look at this "coser's" amazing cosplay! Currently trending on various Chinese gaming news sites and social media is a set of images supposedly put out by "China good COSER"(中国好COSER). The name isn't indicating that he is a good cosplayer, just that he's a good person. Chinese is an interesting language. Coincidentally, his screen name is also the name of a cosplay competition in China. Coser is the Chinese term for cosplayers. Local cosplayers will often refer to cosplay as cos and cosplayers as cosers. 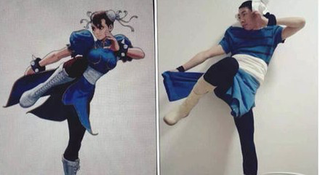 Chinese news sites and netizens have been lauding "China good COSER" for his ingenuity and the low-cost look of his costumes. It kinda resembles Anucha "Cha" Saengchart's low cost cosplay. Okay, so let's jump into the meat and potatoes. The following are "China good COSER's" glorious cosplay alongside the source material. Here's him as King of Fighters' Iori. One Piece's Luffy, pretty straightforward. Sailor Moon... is that a trash bag? Hmm... that kettle doesn't look magic. I'm not too sure I like Doraemon's new look. I don't think Snow White's rolling her eye. I can't tell which is which anymore.